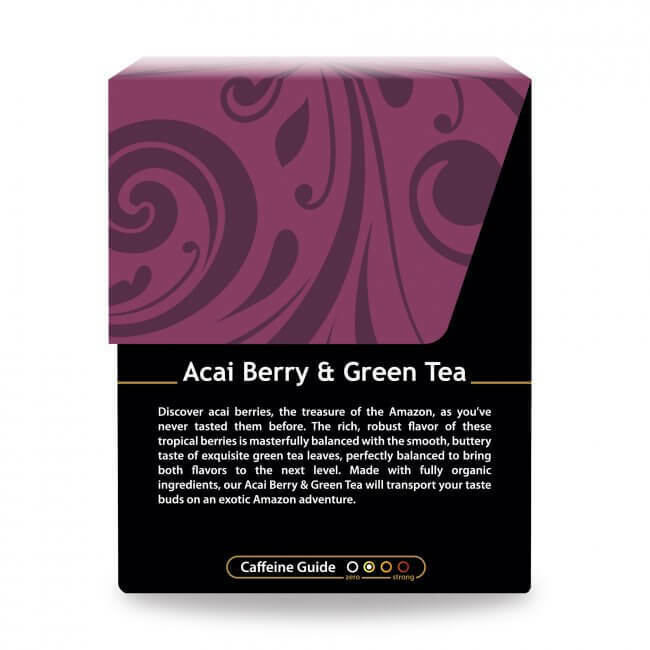 Sometimes translated as fruit that cries, the juicy acai berry, native to the Amazon region of Central and South America, provides a nutrient dense, fruity element to our smooth tasting green tea, making this blend a delightful and nourishing cup of tea. Acai berries are the fruit of the acai tree, a tall, skinny palm that grows in the rainforests of South America. Bearing a rich, succulent flavor, and dense in nutrients, acai berries have served as a food staple for many of the native cultures for centuries, but it is only in the last few decades that this berry has begun to appear on the world market. Acai berries have become a favorite ingredient in many juices and smoothies, not only for their lush flavor, but for their multitude of vitamins, minerals, and antioxidants. 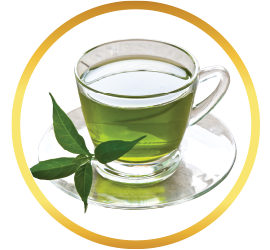 The fruity flavor blends well with the light and nourishing taste of green tea to create a blend that is refreshing and invigorating. What's the Deal with Acai? Fruit that cries … that is what Acai can be translated to mean. (There’s a story behind this, but we won’t get into that now.) Take one sip of our Acai Berry & Green Tea, and we’re sure the only tears you’ll shed are tears of joy. You think we're exaggerating? We promise we're not. 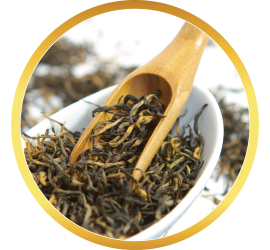 There is so much to love about this energizing, delicious green tea blend, we want to help you dig in a little deeper to discover not only how delightful the taste, but how beneficial the elements are as well. Though botany actually considers acai berries a drupe (a thin-skinned fruit with a stone containing the seed) and not a berry at all, these small round fruits that grow on acai palm trees in the rainforests of Central and South America have been prized in their native land for centuries. Their Oxygen Radical Absorbance Capacity (ORAC) score surpasses that of blueberries! 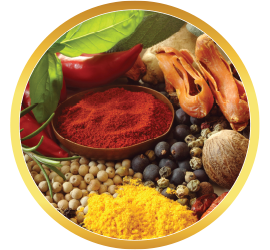 Quick lesson: “A blue, violet, or red pigment found in plants.” So what? you may ask. 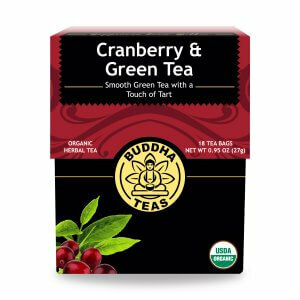 Here’s the skinny: anthocyanins belong to a class of molecules called flavonoids, which, if you’re a Buddha Teas regular you may already know are polyphenolic compounds loaded with antioxidants. What does Acai Berry & Green Tea Taste Like? 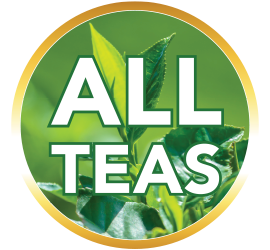 We know that some green teas can turn bitter. We also know that some berry teas profile as tart Our good news: Not this one. Our Buddha Teas Acai Berry & Green Tea isn't too green, and isn't too berry … No, this unique tea provides a subtle, yet complex and potent blend of two antioxidant-rich elements that we’re certain you’re going to love. During the hot summer months, we like to drink this tea cold. 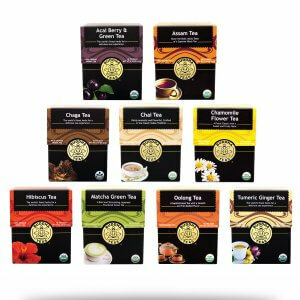 By steeping several bags at once, then adding ice and a favorite sweetener, you’ve got yourself a super summertime iced tea, filled with the goods your body craves, without including additives that often accompany tea blends. 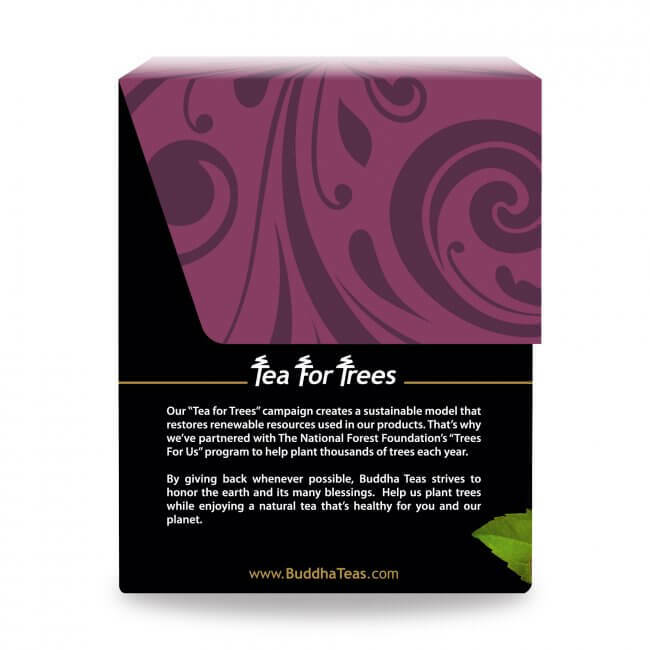 No tea cupboard is complete without this incredible blend of tea. 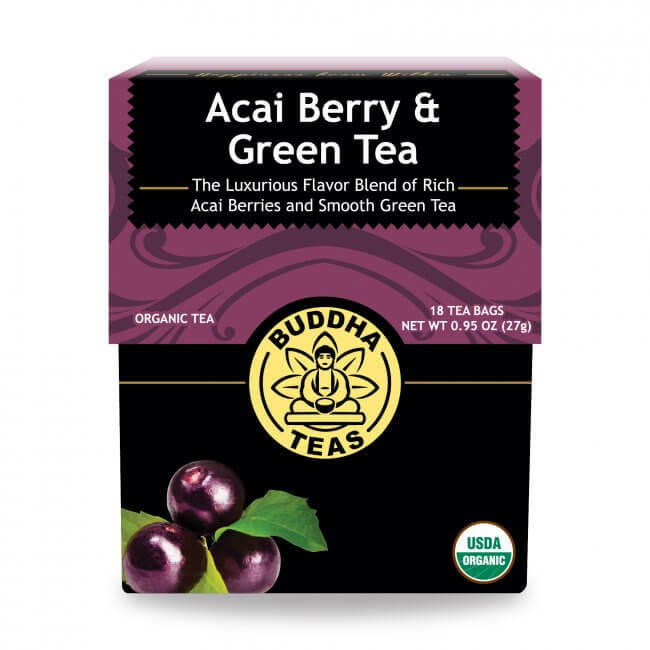 With its invigorating quality and uplifting taste, acai berry with green tea is definitely a Buddha Teas favorite. 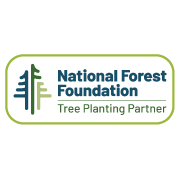 Buy now and use our coupon codes to save money and buy in bulk to save even more money! 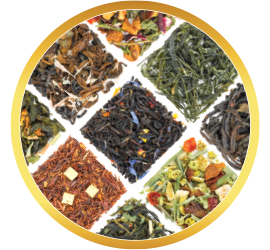 Remember, all orders over $50 dollars will receive FREE shipping and we always take pride in offering fresh, high quality teas packaged in unbleached tea bags. This tea is trussed with a hint of fruitiness! It’s a delightful and refreshing blend. I love this green tea, and it’s great iced too; it needs max stars! 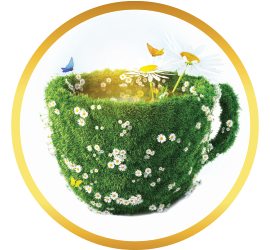 What a delightful and enriching cup of tea! I love the hint of fruitiness combined with the smooth greens. What a lovely cup of tea! I expected this tea to taste like berry, even a hint, but it doesn't at all. I've tried it with less water, as well as two tea bags and I still don't get a berry flavor, in additional to the green tea. it's not bad tasting by any means, rather just not full of flavor as I would have expected. I ordered 6 different flavors of this brand when the cyber sale was on. I’m glad the were on sale because 3 out of the 6 (açaí berry green tea being one) had absolutely ZERO flavor to them. Tasted like legit hot water. The mint one however is excellent. Review Title: Good tea for the morning. 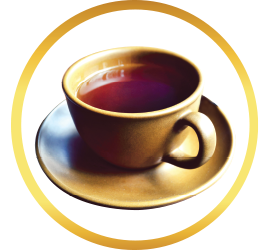 I am very sentive to caffeine and often would find my heart racing and myself getting nervous after drinking coffee, and this tea is perfect for me in the morning. I notice the caffeine, but this is not overbearing at all to me or my body. I will say I was slightly let down by the flavor of this specific tea. I love berries and fruity flavors and the potenecy of flavor on this one is just very weak. Do not get me wrong, tastes alright and is very enjoyable, just was hoping for a stronger flavor. I had never had Buddha green tea. The acai green tea is delicious. 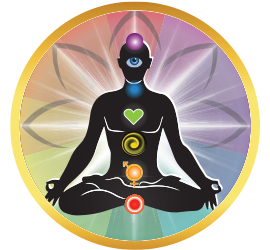 I am going to order the green tea bundle next. I use green tea to make kombucha, and this made the best tasting I have ever had. 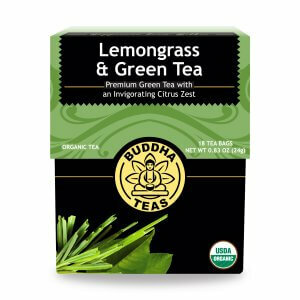 So happy I have discovered Buddha teas. 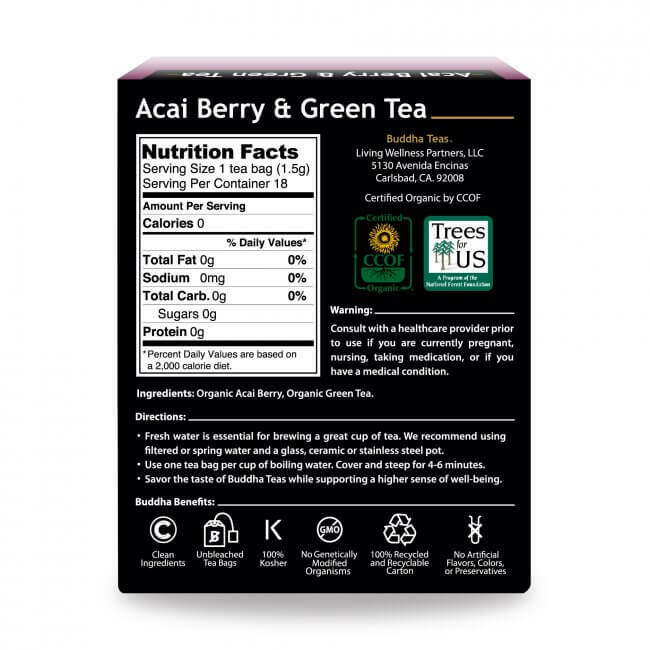 I love this tea, it has just the right amount of acai berry. It's currently my go-to tea, and while I have it with just a little bit of honey it doesn't necessarily need a thing!